We’re a week into the new year and my resolve is just OK. Starting off with a chunk of a cheesecake and a tub of onion dip probably wasn’t the best of ideas (so much for fond farewells) but you assess, adjust and move on. This weather certainly doesn’t help either. I do not care in the least bit to bundle up and take a run on these snowy streets. No need to blow out my other knee just yet. Yesterday, I decided that shoveling my car out of a snowdrift fulfilled my exercise requirement for the day. Baby steps. On to the next task, something I can make some progress on. I’m going to work only with what I have, food-wise, in the house right now. I could easily feed a family of 10 for two months with only what’s in my refrigerator, freezer and cupboards. I blame my short food attention span and the absurd need to stock up with a penchant for stupid sales. It’s a curse but I’m going to get better at this. I have a lot to work through. Today, I started with the fridge and came across a few things that were perfectly fine but had been hanging out for a while. There was the red kuri squash I thought was so beautiful and purchased at the farmer’s market before Christmas. No worries, they’re good keepers. There was the sourdough demi baguette I bought and forgot about, now rock hard. I unearthed a lovely Gruyere of questionable origins. Where did this come from? When did I buy fancy cheese? No idea but it looked fine and tasted better. There was a quart of heavy cream intended for caramels I didn’t get around to making. It smelled good and according to the label, had a few days left in its life cycle. As is typical, my refrigerator was full of good intentions and I needed to make something worthy. More importantly, I needed to make something happen quickly. 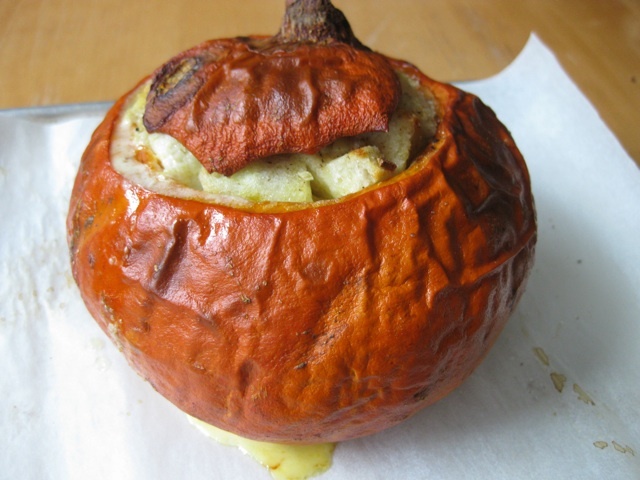 I couldn’t remember my original intentions for that squash but I thought about a recipe I saw in Gourmet magazine a while ago – cheesy fondue baked inside a pumpkin. Yum – I needed something in that vein. A little Google action reminded me of a gorgeous post the ever so fabulous Dorie Greenspan did last year for stuffed pumpkin. It was perfect. I could use all the misfit toys I’d rounded up – the squash, the cream and the mysterious cheese. Even the stale bread was ideal. My squash was looking a little tired with a few less than attractive spots. I needed to dress this ugly ducking up, pronto. First I lopped off the top and scooped out the seeds. Had I been more motivated I would have roasted those bad boys, but not today. I assembled the rest of my ingredients – cubed the Gruyere, hacked up the stale bread into small cubes (easier said than done – it was pretty sad), chopped some garlic, gathered the salt, pepper and cream. I essentially made a savory bread pudding inside the squash with these goodies. The inside was seasoned with salt & pepper and then I layered the bread cubes, cheese and chopped garlic, salt/pepper here and there, then topped off with heavy cream. It needed more liquid so I added some chicken stock to the mixture, put the top back on and baked the little beauty in a 350°F oven for 1 ½ hours until the liquid had been absorbed and the squash was tender. Out of the oven, it was beautiful; golden burnished skin with a creamy bread pudding nestled inside. Wow. I let it cool for about an hour and sliced a wedge. It was delightful – I was thrilled it sliced so neatly (see photo below!) The result was absolutely better than the individual sad little parts. Wonderful. Next time, I’ll add some thyme, perhaps a little cayenne and a bit more salt and that’s how I wrote the recipe below. The measurements are a suggestion – my squash was rather small (1 ½ pounds) and you’ll need more if you have a larger squash. 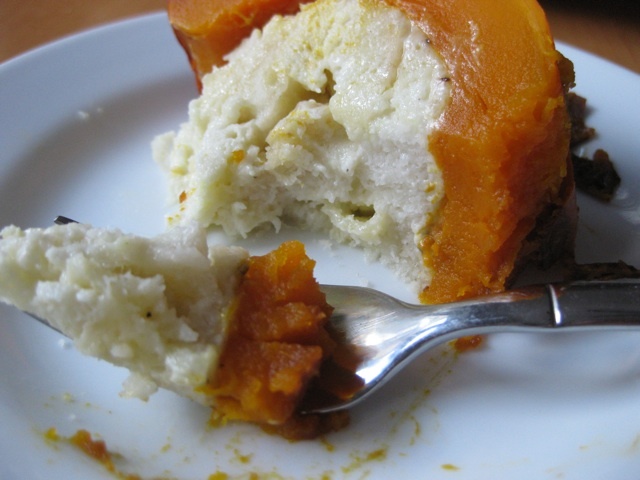 I used a red kuri but other varieties like kabocha, turban and even a sugar pumpkin would work well. Dorie mentions at the end of her post that she added some bacon into a later test. Oh I wish I had read that first, sticking to my bacon mantra. STRESS BAKING THERAPY FACTOR: COZY. Very satisfying – I took a random mish mosh of stuff with questionable origins and shady life spans and made something tasty, satisfying and gorgeous. I felt like I could conquer the world. It was very French country and chi-chi at the same time and it felt damn good. Well that’s a dumbass name – mine, not Dorie’s. Definitely needs some work. Open to suggestions. Place a rack in the lower third of the oven and preheat to 350°F. Season the inside with salt and pepper and place on the prepared sheet pan. 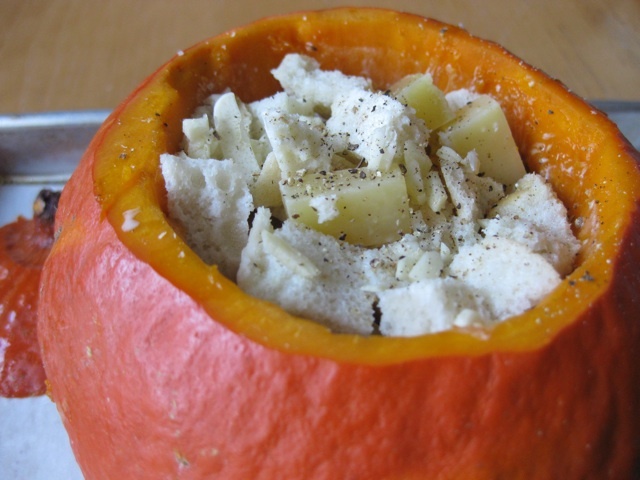 Layer the goodies inside the squash, seasoning in between with the salt, pepper and thyme. So layer the bread, cheese, garlic, salt, pepper, thyme and get the pinch of cayenne in there somewhere. Do this a few times until the squash is full. Really pack it in there. Pour the cream and chicken stock on top of the layered bread. Adjust as needed – add more filling ingredients or more liquid depending on the size of your squash. Per Dorie – you don’t want the ingredients to swim in liquid but you want to make sure they’re well moistened. 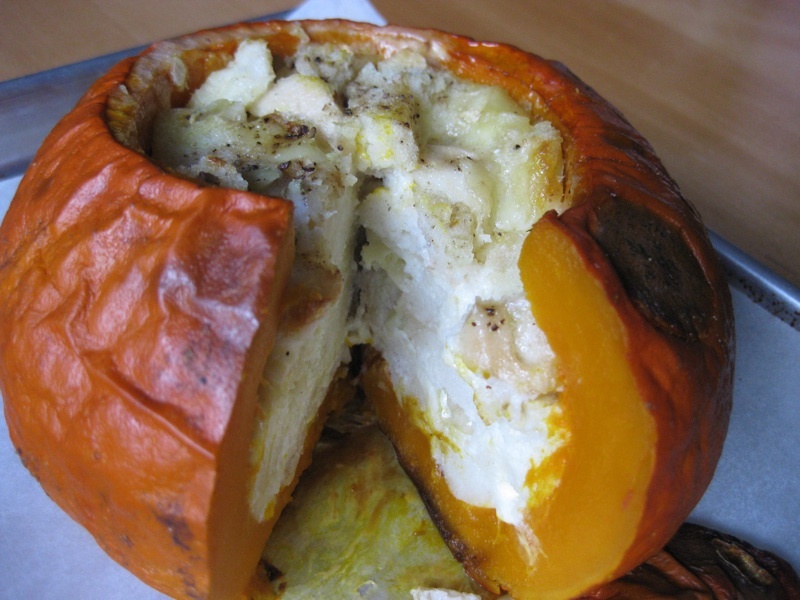 Put the squash top back on and bake for about 1 ½ hours until the filling bubbles and the squash flesh is tender when pierced with the tip of a knife. There are two options for serving. Right away, when it’s hot and bubbly, scoop out servings of the bread pudding including some of the squash. Or you can let it cool and cut into wedges as I did. Anyway you slice it, it will be delicious. I have to admit as much as we all know I dislike squash this recipe actually sounds tasty. 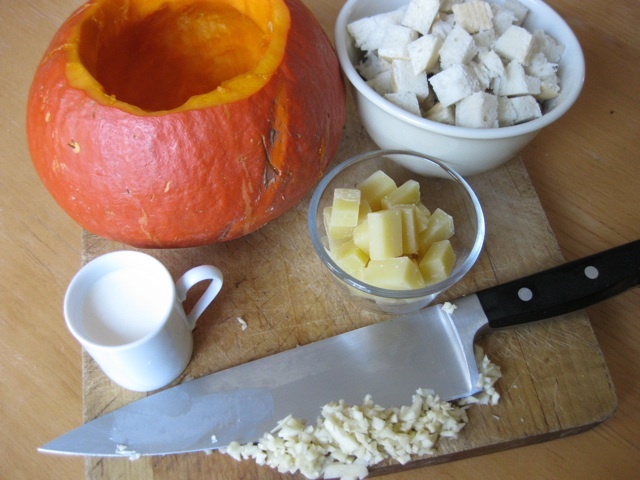 But knowing me…I’ll eat the guts and pitch the squash.